Average weather in Ibiza in winter: sunny! Winter in Ibiza is an excellent choice for anyone wanting to escape the cold of other Euro destinations. We visited from the UK for Christmas in Ibiza, and the average weather in Ibiza at this time was about 18 degrees and sunny during the day! Spain in general is pretty great at this time of year, especially around the Barcelona region or Mallorca, but there is indeed something very special about the islands. This year’s winter in the UK has already been particularly long, grey and cold – worse than last year in my view. That said, I’d prefer it to sweating (southern hemisphere Christmas! ), but this December it was time for a break, which is why we ended up in Ibiza for winter. Last year we visited Copenhagen in Denmark and had some lovely family for Christmas company along for the ride. It was fantastic – a cool city and Tivoli Gardens, the world’s oldest operating amusement park, was a magical highlight. − it needed to be warmer! Recalling that the Mediterranean seemed to be at least sunny when we cruised through back in January 2013, my research began …. And it started in August because previously I’ve left plans really late by which time flights everywhere are expensive. –>staying at a central resort by the beach with American half board (so breakfast and dinners, including seven courses for our special Christmas meal were included in the package). But like many of even the world’s biggest destinations, much is shut over Christmas, and in Ibiza even more so outside of its popular summer season. Ibiza’s small local population swells about five times in summer, with the island boasting the usual beautiful delights of this part of Europe as well as allegedly ‘the best clubs in the universe’ (Ibiza is known as the home of dance music). We were based along Figueretas beach which is situated about 15 to 20 minutes (easy) walk from the main island ‘city centre’, cruise marina, shopping strips and the ‘old town’. Cooper and I enjoy being able to walk everywhere in a town, and it is an activity that is free, can be done in most weather conditions (although we got lucky with sunny days), and regardless of what’s open. 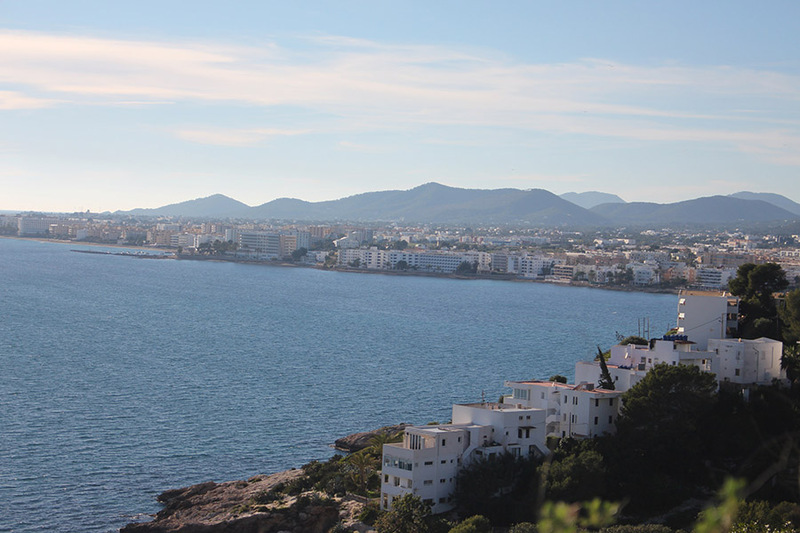 In Ibiza the walking or hiking options are endless, with beachfront, villages, cliffs and green hills to explore. Only thing to be mindful of in our experience, is while it was warm throughout the day, temperatures dropped quickly around 4pm which could be a problem if you are far from home and all of a sudden not dressed appropriately. It’s not a big stretch to imagine that a sun drenched Spanish island is pretty, and Ibiza certainly is. From ocean to mountains, vineyards, cool street art, contemporary and old architecture blending as one, it’s a great destination for the modern content creator. Photographers, videographers, writers and artists will find much inspiration, particularly as the light changes across the course of a day. Unfortunately we just missed this option because of much being closed over Christmas, but there’s a number of day trips you can enjoy around Ibiza even in the winter. That said, try to book in advance online as there is far less operating than between April and October. A ferry to Formentera (the smallest of Spain’s Balearic islands in the Mediterranean Sea) for a chilled out day by the crystal clear blue is something that was recommended and I’ll make it happen next time! Sant Antoni is the main clubbing area and includes the famous sunset strip where summertime ravers enjoy shows by the world’s coolest DJs as the sun sets over the Med. Pretty much everything is closed in winter with only a few cafes and restaurants operating to cater for the boating crowd. But for the curious (like me), for €2 bus no. 3 from Avenue d’Isidor Macabich (a main street in Eivissa’s city centre) will get you to where all the action takes place. In about 25 minutes you’ll be on the other side of the island and can spot locations of some of the famous dance music fun-hubs like Cafe del Mar and Cafe Mambo. Further reading: Ibiza’s best beaches and some of the island’s secret beaches via The Guardian travel. While most up this way in the world are rugged-up at Christmastime, we enjoyed still, warm and sunny 18 degree days. Best to make the most of it then! We thought the Chinese cuisine was delicious and well priced at Restaurant Taiwan along Figueretas beachfront. Just up a bit from there is Oferta, a little family-run hole-in-the-wall (almost) business that was actually open when nothing else was. Their food was good, but don’t accidentally order the cheap local beer that turns out to be non-alcoholic – oops. Next door to Oferta is a larger pub-like establishment, Bistro Magnus; and for a classy meal and cocktail with a view look up Cotton lounge bar, also positioned on the Figueretas waterfront. Bondi at Sant Antoni is a cafe/bar/restaurant opposite the port, not too far from the bus station where we got off the no. 3 from the city centre. The food was delicious with many nice vege options on the menu. Friendly service too. Finally, back over on the Sant Antoni side is a beachfront restaurant called Hostal la Torre – sadly we didn’t get to it but it was recommended for sunset gatherings and if it’s as pretty as its pictures it wouldn’t disappoint. We also frequently bought some nice cheese, salami and inexpensive wine from local Spar supermarkets for beach picnics. Along the main road Av D’Espanya there’s a few lovely bakeries where you can buy fresh baguettes and coffee to complete your DIY lazy long lunch experience. Meditation, yoga, mindfulness under the sun or even sun bathing – it’s all possible here in winter. During the day when there’s no breeze it’s really warm; perfect conditions to ‘just be’. In fact, along the promenade where we were staying I noticed many individuals happily spending quiet time bathed in sunlight; no phones, relaxing, tuning into the sound of the waves, no distractions (except for the odd dog, but even they seemed blissfully content). Explore Sant Josep some more – I wanted to make my way over to a little village called Es Cubells which promises a quaint church on a cliff top and a couple of authentic local bars, but the bus wasn’t heading there during our festive stay. Organise hire of a bike, car or moped for an easier and independent look around the island’s main regions of Eivissa (central), Sant Josep de sa Talaia, Sant Antoni de Portmany, Sant Joan de Labritja and Santa Eularia des Riu. There is an inexpensive bus service which you’ll need to study the map and website to navigate, and you need change to buy a ticket when boarding, but the service is clean and efficient. The no. 10 gets you to and from the airport to the city centre for €3.50 (single), otherwise a cab is about €15. There are many airport shuttle and pick-up services advertised online but they are totally overpriced so be careful not to be ripped off. Ibiza Spotlight features lots of stories and tips for first time visitors on where to eat, travel, club, stay and spend your money. Ibiza bus includes maps and timetables for the local service around the island. Ibiza Tourism – official website.